From Fjord Line's terminal in beautiful Langesund, a range of fantastic and varied experiences are just a short distance away - whether you're visiting Norway or crossing the sea to Denmark. Langesund is a laid-back holiday town that exudes summer and fresh sea air. In the summer months, you’ll always find people milling around the cosy port town, and wherever there are people, there’s always plenty of life! In addition to sun, summer and sea, Langesund is also known for its rich and varied cultural scene, and all the best-known, quirkiest and hippest artists make their way there. During the summer months, why not try your luck at fishing? Or perhaps spend a late summer’s evening looking for crabs? From Fjord Line’s terminal in beautiful Langesund, a range of fantastic and varied experiences are just a short distance away – whether you’re visiting Norway or crossing the sea to Denmark. Yes, toilets on the 1st floor and in the car park. You can park outside the building for 15 mins. For our cruise guests, there is two-day parking available by Skjærgårdshallen. The price is NOK 100. This can be paid directly on the 1st or 2nd floor at Skjærgårdshallen in cash, or you can pay via your mobile phone using the GOMARINA app. You will find Skjærgårdshallen Parking in the list of ports. NB! It is not possible to book parking in advance. Keen to explore Langesund a little further? Here are five tips for how to spend your time in this pretty coastal town. Quality Hotel & Resort Skjærgården’s water park offers fun for the whole family. It’s also a perfect way to go for a dip when the outdoor temperatures aren’t so inviting. The outdoor pool lets you swim around in comfortably heated water while the chilly Nordic air nips at your nose. Badeparken also offers a great selection of slides which are guaranteed to keep visitors of all ages entertained. Right at the tip of Langøya island, directly opposite Langesund, you’ll find a lighthouse that’s steeped in history. Built in 1839, it was in constant use until it was automated in 1990. Today there is a self-service tourist cottage in the old buildings, and Langesundsfjorden Coastal Association has also organised overnight accommodation in the original lighthouse keeper’s dwelling that was built in 1939. Spend the night here while you gaze out over the wild and beautiful Skagerrak. It’s open to everyone, all year round. In the municipality of Bamble, there is the church that Princess Martha Louise first initiated in 1991. With the rest of the royal family present, she laid the foundation for what would become Langesund Church, after its predecessor burned down in 1988. Among others laid to rest in the churchyard is the Danish-born maritime officer Hans Peter Holm, who fought in Norway during the war of 1812. Langesund’s renowned concert stage has welcomed global stars such as Bob Dylan and Elton John, although in the 19th century, reality was slightly different. The building actually served as the town’s post office, and was originally constructed by the merchant Just Wright, hence the name Wrightegaarden. In Langesund, you can combine a visit to Wrightegaarden with a cultural event, or use the time to explore the historical building a little further. Tangen fort was first built on Langesundstangen by the German occupying army during World War II. The building has been demolished and the bunkers filled in, but the surrounding area is protected as a conservation zone. The public is free to wander around, and its location at the tip of the island of Langesundshalvøya turns Tangen into a beauty spot right by Skagerrak. And there’s always the breath-taking view! If arriving via the E18, follow signs to Langesund/DK. Approx. 100 metres from the terminal building. Take the R11 train towards Skien from Oslo S. Get off at Porsgrunn. See timetables at nsb.no. From Skien and Porsgrunn you can take the M1 bus to and from Langesund. You will arrive at either Langesund town centre, or Halen gård. It’s about a 10-minute walk to the ferry terminal from the town centre and about a 2-minute walk from Halen gård. See timetables at farte.no. Fjord Line works in partnership with Grenland Taxi. Our passengers receive a discounted price on presenting a valid ticket. 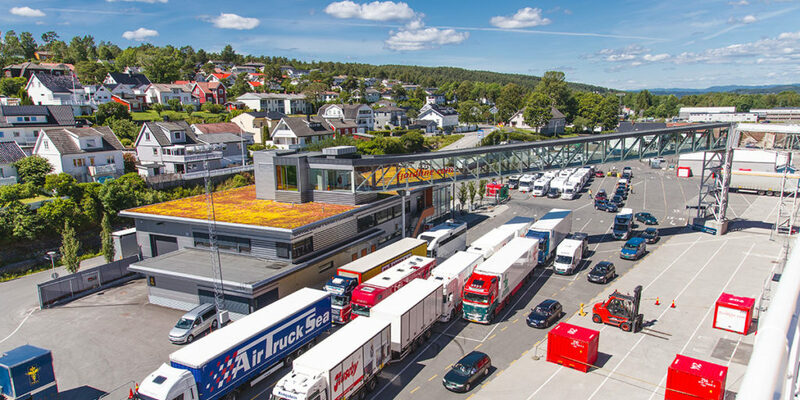 Please arrive at the terminal in Langesund at least 60 minutes prior to departure. All days from 12:00 to 14:30.